Today is the day children head back to school here in Michigan - my grandsons are on their way to Day One of the 2015 school year . . . and they look so cute . . . I mean cool! Fall in Michigan means school, cooler days and apples, so when I browsed on Pinterest this morning and found a recipe for apple cookies, I knew I had to share it with you! I am confident I will be making these cookies as soon as I can get some apples! 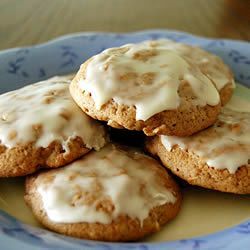 Just follow this link and you'll find the recipe for a, soft, apple cookie which would be a perfect Fall treat! Consider taking your grandchildren to a local orchard (if you have any near you) to pick some apples, or visit a farm market to select the perfect apples, then make your cookies. Make extra so you and your grandchildren can take some to neighbors, shut-ins you know or to give to their teachers. As you make your cookies, be sure to talk about how thankful we are God created apples! You might even look on-line to learn about the many, many different varieties of apples . . . this could be another fun trip to the orchard or market to buy different apples than you have had before to try a new apple!